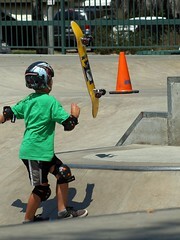 On Tuesday I went to the skate park with Blake and Nan. We all had fun at the skate park. First Blake and I went down a very steep ramp. We was scared but we still went for it. Have you ever been down a steep ramp? Posted on November 17, 2017 by Miss W.
Hi I’m Riley and I’m seven years old. I’ve got 2 brothers and a sister. I have a dog named Jesse and another dog at my Mum’s house. I enjoy going to the skate park with Blake, my brother.